From hawkers to schools, many players have emerged in Singapore's war against diabetes, which was first declared in 2016. This is the first in a series examining the efforts at the frontlines of this expansive battle. Ms Betty Ng, 73, went with a friend to Tiong Bahru Market, all the way from Ghim Moh where they live, because they had heard of a stall there that offered healthier versions of Teochew kueh, with whole grain rice. The two women were almost too late. They reached the stall - also called Teochew Kueh - around 11am and learnt that sometimes, by that hour, its offerings would have been sold out. The stallholder, Mr Law Teng Hwa, 59, said that healthy eaters like Ms Ng and her friend have boosted his sales by about 5 per cent since he started offering brown rice versions of his kueh. Now, the ones with brown rice outsell the original white rice cakes. When the Health Promotion Board (HPB) approached the stallholders to provide healthier versions of their kueh, Mr Law along with his sister and mother, who founded the stall in 1974, got together to perfect the new recipes. "We had so many trials," he said. "Now I dare to say that the brown rice ones taste better." His most popular offering mixes brown and white rice along with black beans, peanuts and shrimp. 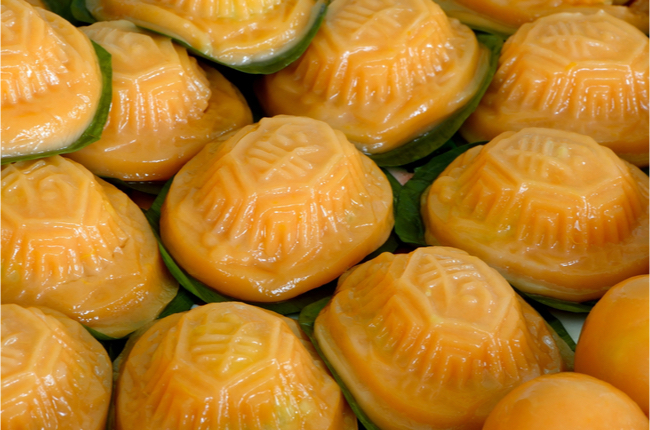 Next is his peng kueh, the triangular pink cake stuffed with a mixture of brown and white rice. Mr Law said he had tried making the covering with brown rice, but it looked a shade of maroon that customers did not find very appetising. On the other hand, the customers were all praise for the concoction of sticky rice - 20 per cent of which is brown - with peanuts and shrimp. "They say it's easier to digest," said Mr Law. Although brown rice costs more, he charges the same price of $1.20 for both versions. Earlier, the stall used to close on Mondays and Thursdays, but demand has been so high that Mr Law now opens it every Thursday to offer more healthier items. Not all stalls offering healthier options have met with similar success, however. The Original Tiong Bahru Golden Pig & Roasted stall offers brown rice. Stallholder Chan Pak Seng said they usually sell 10-15 servings of the brown rice. His wife chipped in to say that customers have to be persuaded to try this - sometimes with a mixture of brown and white rice. Even so, they do not always manage to sell all their brown rice and sometimes eat the leftovers themselves. But Mr Cheong Kwok Kee, 68, of Chow Kee which sells noodles and rice with fish or beef said sales have remained the same after he replaced his white vermicelli with a wholegrain version, and mixed white rice with brown. He continues to sell the normal yellow noodles and flat rice noodles, but said that people who want vermicelli or rice just accept the healthier option: "No one has complained or changed their orders." Some 4,000 stall holders offer healthier food . Some throw in more vegetables or use less salt or oil. The idea is to make it easier for people to choose healthier meals, since most workers tend to eat out. Healthier eating options are also part of Singapore's War against Diabetes. The idea is to reduce the consumption of refined rice and flour, which converts to sugar in the body. The HPB plans to get hawkers in 20 more centres, such as Geylang Serai and Tekka market, to offer healthy options in the coming year. Among developed countries, the prevalence of diabetes in Singapore - the disease is among the worst chronic killers here - is second only to that in the United States. About one in nine adults under the age of 70 years here is diabetic. The rate is higher among older people. The last national health survey, in 2010, found that half the diabetics did not even know they had the disease . Also, half of those who suffer a heart attack here, and almost half of the people who have a stroke are diabetic. The School of Public Health estimates that if the current rate of diabetes continues unchecked, Singapore would have one million diabetics by 2050. They will cost the country $2.5 billion a year in healthcare cost, lost income and need for care. In the face of such prospects, stalls like Mr Law's are trying to turn the tide.